It’s been a few months since I posted on the progress of the Proto:87 Posse. Since that time, we have visited Jim Peters and Julian Watson and mostly talked about their plans. This month we were out to Andrew Hutchinson’s place, where we spent a little time reviewing his ideas for a small display layout. Then it was out to the shop to work on Julian’s modules. Julian is building a P:87w63 (That’s Proto:87 5’3″ gauge) layout of Victorian Railways. He started with six modules that he built in Perth and had shipped over here, but has decided to redo the bases as he was not happy with their precision. For the mulligan, he is going with the new-fangled construction popularized in MRJ. By golly this is a lot of work! It had better be worth it! At the end of the evening, with four of us working on gluing and nailing, we had enough bits to put together three modules, but we pulled the plug before doing more than a test-fit. It’s been two months since we were at Chris’s house. In October we traveled out to Langley to visit Jim and see his space. It was largely a talking session, and I think he’s been convinced to bend Prince Rupert around the room to allow a little running room. He’s in the middle of renovating the main floor of his house right now, and just sawed off the ends of his fingers, and so, it will be interesting to see his progress the next time we’re out there. This month we went to Julian’s place and mostly thumbed through his collection of books on Victorian railways and checked out his baseboards. We made a giant stack of baseboards so we could work on height visualization. Next month we’re out to Andrew’s where he’s coming up with a plan for a small portable display. Then in February, we’re at my place again. Hopefully by then the basement’s ready to receive a layout, as I have every intention of putting these eight hands to work and getting a start on building when they’re here. I’d better get to work! Where did I put that Tuck Tape? This week, the Proto:87 Posse (we had to come up with a catchy name) showed up at Chris’ house. Chris has benchwork in place for half his layout and wanted some help on figuring out what to do with it. He’s new to Proto:87, but I have a feeling, judging by some of the track he’s handlaid before, that he’s going to be a big producer once he gets going. 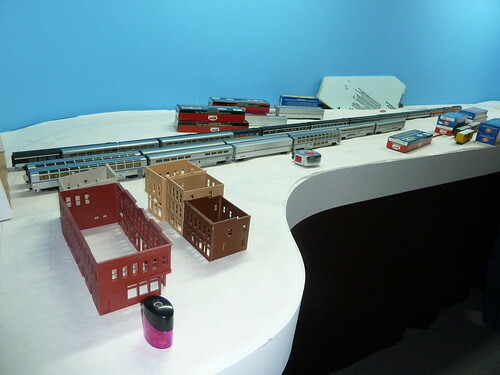 He’s been collecting passenger equipment and has a ton of really nice cars. Sadly, like all of us, he is a wee bit tight for space, and so, we’re not going to see the Super Continental winding its way through the Rockies on his layout. We did come up with what we believe is a workable concept for terminal switching his passenger trains, though. There is also space for a tiny bit of freight switching, but the focus is going to be passenger. We left him with a table top covered in trains and boxes, all aligned along hastily drafted full-size track center lines. By the time we were done, we were all excited about the concept, and we really hope that the radii actually work out. His homework for next time is to get some P87 wheels under some of his passenger cars, the Rapido ones especially, and play with them on the different radii of tracks. We’re quite concerned that the working diaphragms are going to be a problem on 42″ curves. On Saturday, September 3, we had the first ever meeting of Proto:87 modelers in Vancouver. Julian Watson, who moved from Australia a week ago Thursday, suggested we get together, and Jim and I put out a notice to our respective networks. In the end, there were five of us to share burgers and beers on my deck. We had a good time jawing about wheels and track and ultimately decided we would form a round robin group to help with each other’s layouts. We’ll be meeting the first Wednesday of the month, starting at Chris’ in October. Watch this space! 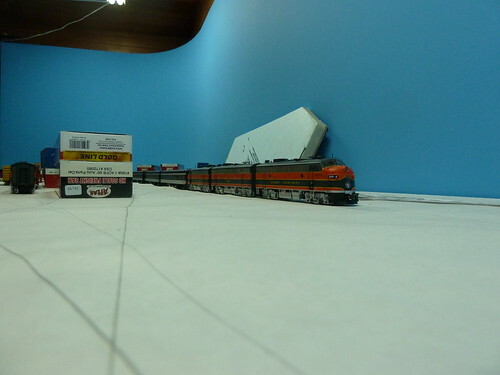 The Sacramento NMRA convention is all over, and I’m returning back to Vancouver to get properly started on the layout room renovation. I presented a well-received Proto:87 clinic on the Monday. I started with an overview of the history of Proto:87 back to the early days of the Model Railway Study Group in the late ’60s, and brought everyone up to date with the currently available products. I guess there were about 25 people in attendance. One surprise for me was the amount of the confusion between Proto:87 and Code 88. Code 88 refers to a popular, though non-conforming, wheel dimension used by some HO modelers. The “88” is the width of the wheel in thousandths of an inch. While code 88 wheels do not conform with the HO standards, and thus will not work on all HO track, many modelers have success with them on a subset of available track. Because they spend all their time looking at rolling stock, and the track is an afterthought, these modelers are content to run with a wheel that is merely 37% oversize (rather than 71% as the standard code 110 wheels are). They ignore the flangeways and other compromises in the track. Proto:87, of course, specifies both track and wheels that are accurately scaled from the prototype. There was much Proto:48 action in the contest room, but I didn’t notice any Proto:87 other than my own.